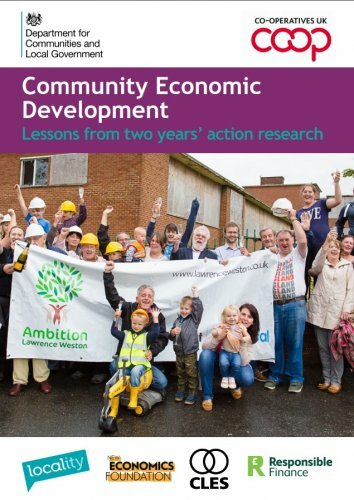 This report summarises the lessons learned from a two year nationwide action research programme of Community Economic Development (CED). It will be of practical interest to communities thinking about their local economies and policymakers tasked with fostering a more inclusive economy, locally and nationally. Unlike conventional approaches to local economic development, which centre on economic growth and are led from the top down, community economic development (CED) is a process that is led by local residents and focuses on generating wealth and jobs that stay local. This two year programme, led by Co-operatives UK, supported 71 communities across England to develop and implement plans to shape their local economy. The report finds that CED is a way to give people real power in the local area and interest in the approach is growing in the context of calls for more ‘control’ in local areas and the reduction in inequality. It also highlights that the most effective approaches to CED focus the community’s energies on taking control of a particular asset or building on existing local plans to transform processes not previously working for the local community. However, it also concludes with three challenges that need to be addressed to make CED more effective on implementation. CED plans do not always align with conventional measures of economic development. For them to cut- through a shift is needed in what is measured, from single growth measures to wider well-being and local wealth. CED plans can be overlooked. They should be embedded within wider policy processes like Neighbourhood Planning and LEP planning, and could be given a statutory footing, to ensure it has legitimacy with stakeholders who held power or mandate. The community economic development programme was funded by the Department for Communities and Local Government, and delivered in partnership with Locality, New Economics Foundation, CLES and Responsible Finance.